Facebook published a 14-page guide outlining best practices for social media marketing on the networking site. According to Readwriteweb.com, the guide serves as an official marketing resource to help marketers make the best use of the social media platform’s advertising products, analytics and various tools for business growth. The guide begins by explaining how the Facebook ecosystem can enhance the effectiveness of a social media marketing campaign. Then, the guide defines the “five guiding principles” for social media success, which include building a strategy that is social by design, using an authentic brand voice, making it interactive, nurturing relationships, and continuing to learn from feedback and reporting tools. The guide proceeds to show how the social media marketing tool can help companies achieve business objectives, such as generating awareness, increasing traffic and sales, building loyalty and relationships, and intensifying word-of-mouth. Five steps for accomplishing each objective with Facebook’s resources are clearly illustrated, along with examples of how well-known brands have used these tools for social media marketing success. 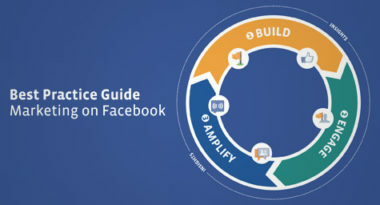 While this guide was created to help social media marketers connect with consumers and reach their business goals, a key benefit will be showing the best practices for achieving the best results from Facebook marketing campaigns.